This is a small configuration with only a few spindles configured. But it gives us an idea on how NDMP performs. Since the performance of those SATA drives was so bad, even when configured as RAID10, I decided to perform my tests only on FC drives in RG0. I’ve carved two LUNs from RG0 and mapped them to the X-Blades. The LUNs are pooled and bound together using AVM on the NS20. Later a single CIFS file share has been created and populated with sample data. Then the NDMP Media Agent was installed to my Windows 2008 x64 SP2 Cell Manager which already had access to the library. This does not hurt, as the existing MA is just expanded with some NDMP specific features. Creating sample data using HP Library and Tape Tools is quite simple, since HPCreateData and HPReadData are integrated into LTT. Each job pointed to a different directory on the CIFS share. In sum about 13.5 GB in 192956 files have been created. 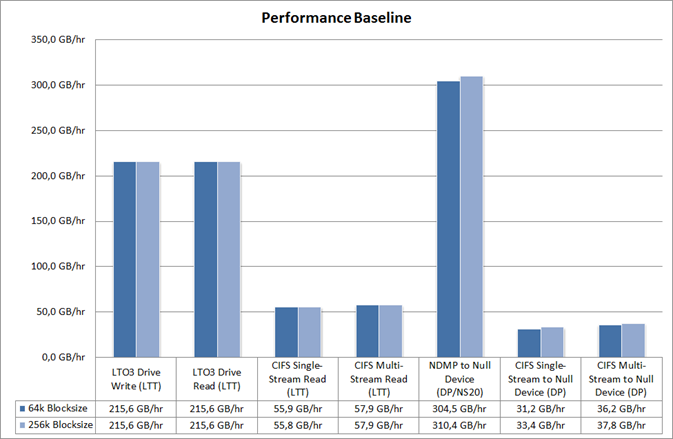 As expected NDMP Null Device and local performance of the LTO3 drive was much higher than native network (CIFS) data transfers. There are tweaks around to optimize CIFS/NFS performance. I’m aware of those, but they have not been applied in that scenario. There is a single GbE link between a Windows 2008 host and the Celerra. There are only slight differences (up to 2%) in those tests regarding the block and transfer size. The most benefits have been seen for the LTO drive, especially with very large transfers (1MB). A higher blocksize in general allows higher transfer rates. CIFS backup and especially restore performance are unacceptable slow. A CIFS backup requires a lot of tuning and testing and is less reliable. If you plan to use multiple Disk Agents on a share of a local disk, separate the file system in similar slices to parallelize operations correctly. This allows good restoration speeds using Data Protectors Parallel Restore afterwards. Nice to know, an NDMP overwrite restore on the Celerra takes much more time than a redirected restore into a different directory. Since there is no native Data Protector Disk Agent available for the major NAS platforms, NDMP offers many benefits over a CIFS/NFS backup. Only the catalogue is send to the CS while the NAS head does the whole data movement – directly to tape. In case of the Celerra Snapsure can take care of automatic replica creation as source for NDMP dumps. Some restrictions apply: NDMP does not allow Object Copy or restores to a non-NDMP clients, which could be an issue. Further optimization is possible; it will take time depending on the configuration used. As the X-Blade/NAS head performs writing and reading data to and from tape, it should be the first stop. 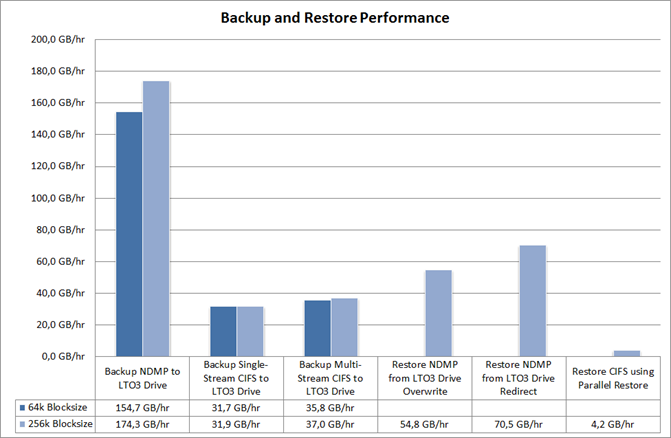 For example, changing readWriteBlockSizeInKB for PAX and bufsz for NDMP to 256k allows 12% faster backup performance. A next step would be to investigate parameters paxWriteBuff, nThread, nPrefetch, paxStatBuff and nFTSThreads. Multiple Disk Agents on the same share are a good option to keep your feed rate high. My configuration is not ideal to demonstrate this, because three DAs where working on completely different folder structures. DATA_L which contains only a small set of very large files, DATA_M which contains a moderate amount of medium sized files and DATA_S which contains a lot of very small files. The result is easy to predict, DATA_L and DATA_M where complete quickly while DATA_S requires the most of the time. This also applies to restores. To make this clearer, without DATA_S in the restore job, I was able to achieve about 16 GB/hr for a CIFS restore session compared to 4.2 GB/hr. Everyone who is interested in null device backups on Celerra, try the following command. The backup software will load the cartridge, but no data will be written to tape. This is the only way to verify file system performance during backup time. As no data is written to media, Data Protector will report such a session as failed. Display the throughput during a NDMP backup session using server_pax server_2 -stats -verbose. The Get pool and Put pool are good indications if the system performs well or not.